Having learned HTML in the 1990s, I’ve always felt very comfortable with it and I’ve used plain text or HTML in text editors for as long as I can remember when I’ve been writing something. However, I’ve finally taken the plunge into Markdown now. While I’ve felt extremely confident with my various editors and their setup with regards to shortcuts, snippets, HTML support, themes and much much more, I also like trying different approaches to existing tasks. For me, using HTML for editing text has been so deeply rooted that even if I’ve been aware of Markdown for a long time, I’ve never really seen the point before. However, time and simplicity becomes more and more important, and using Markdown can be very quick to get some basic formatting/structure right, while keeping the document as readable as possible. And, of course: we can always learn and get better at what we do. So keep trying alternatives! 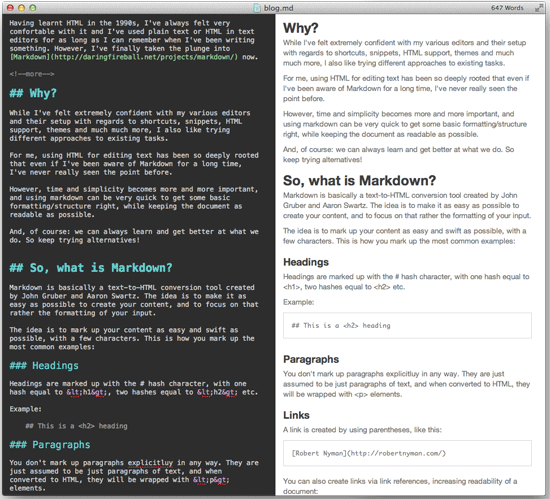 Markdown is basically a text-to-HTML conversion tool created by John Gruber and Aaron Swartz. The idea is to make it as easy as possible to create your content, and to focus on that rather the formatting of your input. Headings are marked up with the # hash character, with one hash equal to <h1>, two hashes equal to <h2> etc. You don’t mark up paragraphs explicitly in any way. They are just assumed to be paragraphs of text, and when converted to HTML, they will be wrapped with <p> elements. Note: It got pointed out to me, the empty brackets in the above example aren’t needed either. or indent it as a block with tab/minimum 4 spaces. There are tons of ways for various text/code editors to add Markdown support, and to be able to edit it, convert it to HTML and much more. I tried that a little, but then Rob Hawkes suggested that I’d rather used a dedicated Markdown editor, instead of adding it on top of all features in my normal editors. He suggested Mou to me, and so far I’m quite happy with it! It has a bunch of shortcuts for the most common formatting and exporting or copying the content into HTML. It also has a nice live preview and a few good themes. Either way, trying things is fun! Let’s have fun! Love Mou. Waiting for a webapp to capture its feature set. http://dillinger.io is probably the closest, though I really do want the header fontsize boost in markdown view. Yep, the easiest approach possible! Good to hear! Yes, Dillinger seems quite good, but agreed on the font size. It’s a nice extra touch! I host my blog through github, which uses markdown for everything, so I’ve been enjoying using it via Mou for quite some time. It does make things much more readable in source. And yes, I think that readability part is very important, both for us but also for getting other people to write things and get going. I wish I had done that research before the post, so I really appreciate hearing about options on other platforms. If for some reason you prefer to use your usual text editing tools, then there’s also Marked for previewing your writings. I’ll take Mou for a spin, great tip! For the simplest path from your markdown editor to your blog, check out Markbox (http://www.markbox.io) – save your post to Dropbox, and a minute later its live on the web. I’m the developer – feel free to hit me up anytime to ask questions!